Repairing your garage door can be incredibly dangerous and should only be attempted by an experienced and well-trained technician. However, there are some simple maintenance procedures that you can perform by yourself to help your system last for as long as it possibly can. 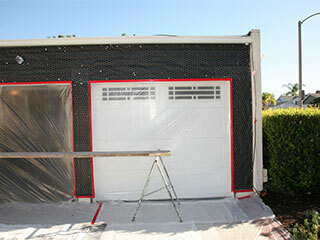 This is one of the main methods of regular garage door maintenance. Making sure the springs, rollers and every other relevant part receives the proper lubrication on a regular basis will help to reduce friction during the system's operation, and will help things stay in good shape. If your rollers are of the nylon-coated variety, do not lubricate them. To know which type of lubricant you need to use, you can consult your owner's manual, or simply give our experts a call. Making sure every part of your garage door system is in good shape can be crucial. It will help you catch minor issues before they develop into large-scale problems, and therefore, effectively help you prevent potential accidents. Make sure the springs aren't showing signs of wear and tear, check the cables to see that they haven't gotten frayed, and inspect the tracks to make sure they aren't dirty and are free of debris. The exterior of your door panels is exposed to the elements, which is why it could do with the reapplication of the appropriate protective layers. Wooden doors require a certain kind of varnish, and steel or aluminum ones need a different type of coating. Since these protective coats will wear out or fade over time, it'd be prudent of you to reapply them every year, in order to preserve the door's condition. If you find yourself facing a problem you're not sure of how to handle, or if you find any of your garage door components have become too damaged, reach out to our experts at Garage Door Repair Palatine. We'll repair or replace the damaged part and make sure your system is as safe and secure as it can be. Call us today.